Forex traders said that dollar demand from importers and heavy selling in domestic equities added pressure to the domestic unit. At the Interbank Foreign Exchange (forex) market, the rupee opened lower at 69.40 and fell further to touch the day's low of 69.71. It finally ended at 69.67 per dollar, down by 44 paise against its previous close. 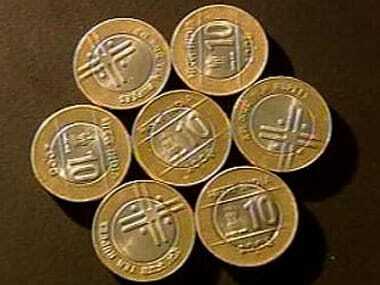 "Rupee started the week on negative note amid surge in crude oil prices. Rupee contracts fell across curve for third day amid dollar demand from the oil importers," said VK Sharma, Head PCG & Capital Markets Strategy, HDFC Securities. The dollar index, which gauges the greenback's strength against a basket of six currencies, fell 0.21 percent to 97.19. Brent crude futures, the global oil benchmark, rose 0.43 percent to $70.64 per barrel. "Oil extended its rally to a five-month high as conflict in major producer Libya increased the risk of new supply outages. Brent crude oil last quoted at $70.59 barrel up 0.4 percent, highest level since November 2018," Sharma said. Meanwhile, foreign investors (FIIs) remained net buyers in the capital markets, putting in Rs 329.60 crore on a net basis on Monday, as per provisional data. "(The) RBI in its recent MPC meet did not explicitly shift tone to accommodative from neutral which puts a question mark on the growth prospects for Indian assets. This did not go down well with the forex markets which led to an INR sell-off," said Rajesh Cheruvu, Chief Investment Officer, WGC Wealth. Many emerging currencies weakened in the day despite positive news flow of the US–China trade talks and US jobs reports allaying global growth fears. This suggests market participants have already priced in these news snippets and look to book profits in riskier assets which are likely more sensitive to any downside, he added. Equity benchmarks Sensex and Nifty Monday faced high volatility and closed with losses. The BSE gauge Sensex ended lower by 161.70 points at 38,700.53, while the NSE Nifty lost 61.45 points to settle the day at 11,604.50.